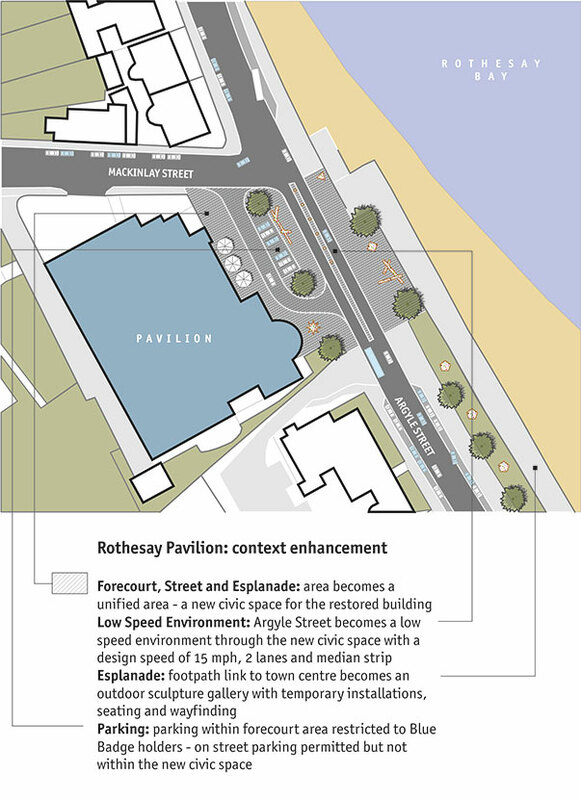 In March 2016 WMUD was part of a team led by Icecream Architecture, including Nick Wright Planning, tasked with delivering a Planning Charrette for Rothesay. Funding for this project was from the Scottish Government, SURF and Mount Stewart on behalf of the Alliance for Action. The Charrette process was focused on delivering projects and securing resources for Rothesay, especially in relation to the ongoing Townscape Heritage (TH) project. 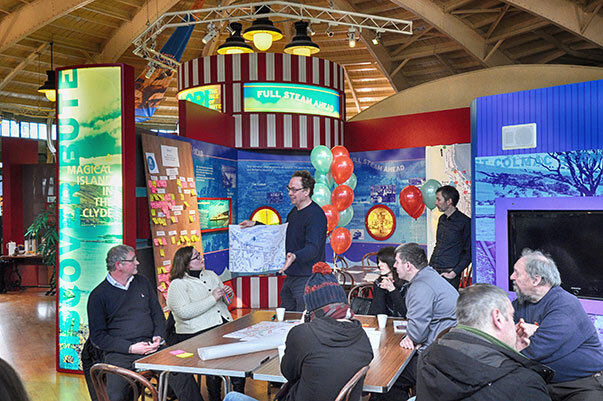 Icecream Architecture carried out an extensive and innovative engagement exercise with the local community and stakeholders in advance of the Charrette itself. This was carried out through on-street discussions, one-to-one interviews and business consultations supported by social media and a graphic identity ‘Remaking Rothesay’. The Charrette focused on verifying and developing the themes and topics that emerged in the pre-Charrette consultation period. Facilitated workshop sessions encouraged participants to share their thoughts, worries and aspirations for the future of Rothesay and the broader Bute context. After the four days of intensive work and numerous ideas, two key drivers developed, ‘Retain more people’ and ‘Attract more people’, summarised the main aspirations for the town. These key drivers were developed through projects and proposals for collaboration, communication, finding uses for vacant buildings and spaces, creating jobs and developing skills and accessibility. WMUD’s work focused on developing a spatial strategy that to make the town centre more pedestrian friendly and therefore a more attractive place. We proposed a new low-speed environment along the harbour front and ferry entrance up to the Discovery Centre and the eastern roundabout which would slow down traffic through narrower lanes and make it easier for people to cross the road. Slower traffic speed would change the character of the seafront from an overly wide street to a place where people can feel safe and comfortable. 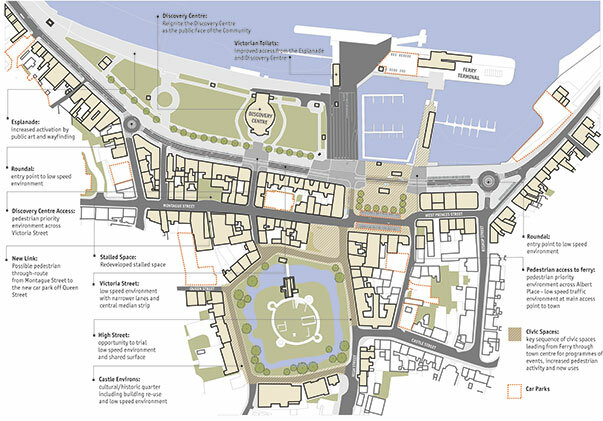 Crossing points would connect the town centre to the harbour/seafront area and the wide ferry terminal entrance would be visually narrowed to look and feel less dominant while keeping it fully accessible for ferry traffic. A change in road surface would also be applied to the area around the castle in order to enhance the historical importance of this part of Rothesay. It would be made more pedestrian friendly with improved accessibility and encourage local premises to use the space outside their shops for outdoor seating or displays. We also proposed a change in road layout outside the Pavilion, which is currently being restored and converted into a community hub. The idea was to slow down traffic and enable a safer environment between the important promenade walking route from the Ferry and town centre to the restored Pavilion. The promenade itself would become a home for art installations which would create interest along the seafront and guide people to the new facility. Accessibility of the town centre was a central issue discussed during the Charrette and there was a clear call for increased consideration to ensure any town centre developments go beyond the minimum requirements. Actions relating to this are highlighted in the Guiding Principle ‘Accessible and easy to get around’.